The purpose of the Caulbearer is to serve Mankind and to guide men and women to understand themselves and the world and universe within which we live. How should a Caul be removed? As the caul is a membrane which covers the face of certain children at birth, it is regarded as being of human tissue, and part of the child. Firstly, upon recognising that the birth is a caul birth, two small holes should be cut for the nostrils and one for the mouth to enable the child to breathe. The caul should then be slowly peeled from the face to avoid any damage. What does a Caul look like? 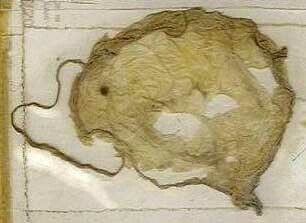 As there are many misunderstandings about what a caul looks like, we have provided a picture of one. This particular caul is more than sixty years old and is still held by its owner. You should particularly note the unique characteristic of the ear loops, which mark it as being different from other cauls.